After returning from Brazil, Daniel and Jennifer realized Santa Barbara didn’t have a Brazilian restaurant. They were already operating a Capoeira studio, and thought they could add a juice bar with Brazilian appetizers and sandwiches. 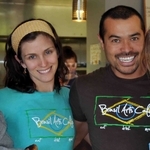 With help from their family, and WEV’s SET course, they finished their business plan and saw their dream become reality with Brasil Arts Cafe. In 2014, they returned to WEV for an expansion loan. Today the cafe is a bustling venue, providing authentic food, dance fitness, and live music.